Last Thursday was a great day because I met a great man. I met a man whose courage brought him to the pinnacle of space exploration by becoming the second human being to set foot on a celestial body other than Earth. I met astronaut Edwin "Buzz" Aldrin Jr. ScD. Dr. Aldrin was at the Griffith Observatory here in Los Angeles for a public signing featuring his new book “Magnificent Desolation.” This was the phrase he used to describe his first impressions as he walked on the surface of the moon. Dr. Aldrin started the event with a motivating overview of his life and most remembered accomplishment. He specifically stressed that everything he was able to achieve in his life was due to fine education. 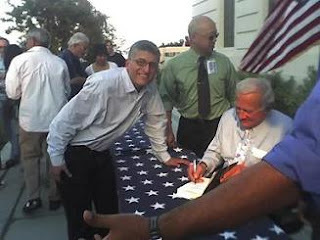 He attended West Point and in 1963 received his doctorate in Astronautical Engineering at MIT. I was pleased he made this emphasis because of the number of young people in the crowd. I arrived at the observatory a good two hours early so I could spend some leisure time doing research over at the Café at the End of the Universe, the food facility at the observatory with a superb view of the city. I thought it was appropriate to dig into some recent ideas in general relativity and cosmology as I waited for the event to start. I also purchased my copy of Dr. Aldrin’s book at the observatory’s bookstore. As I sat there, I noticed a sense of anticipation from the folks stopping in for a cold drink on what was a scorcher of a day (98 degrees at the observatory). Families with small children were also coming through, and I knew it was shaping up to be a very successful event. As sunset arrived and the heat of the day started to dissipate, the L.A. Astronomical Society set-up several large Celestron telescopes appropriately pointed at the Sea of Tranquility where Dr. Aldrin walked. 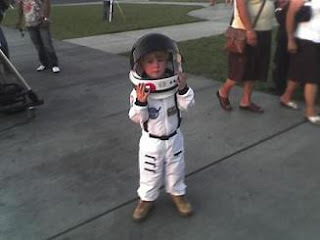 There was one particular tiny space enthusiast named “Aaron” who was dressed in full astro-regalia (see attached photo). His parents said the three-year-old was wild about space. Aaron anxiously climbed the step ladder to reach the eyepiece of the telescope to witness the first of hopefully many celestial wonders he will experience in a life of science.